Laser scanning, also called high definition surveying (HDS), is a method of high-accuracy mapping or reality capture that uses laser beams to quickly capture complete detail of the entire building construction project—much like a camera taking a 360-degree photo, but with an accurate position for every pixel. 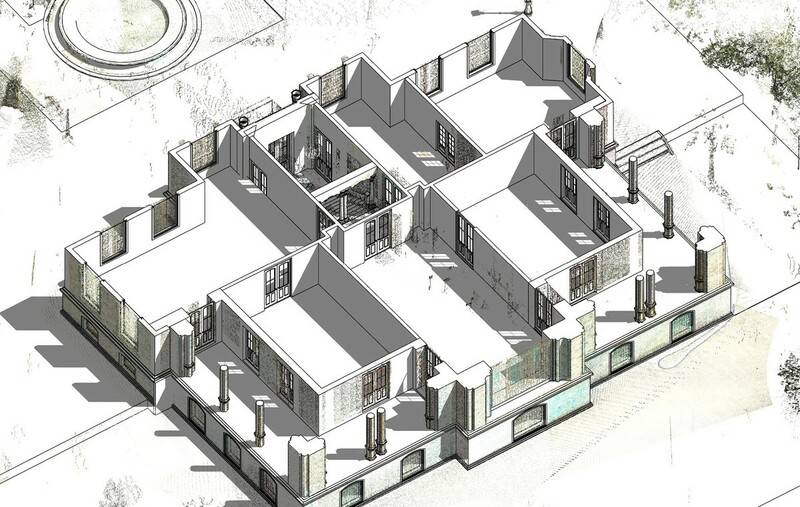 This detailed 3D representation of the building project is often called a point cloud. Originally applied in the construction and maintenance of industrial plant facilities, laser scanning has since been adopted for many other uses, including building construction and building information modeling (BIM). Many modern building construction projects are renovations or redevelopments that lack current construction or maintenance documents on the existing facility. In these situations, the rich, complete data captured with a laser scanner can provide the required information on existing building conditions with the accuracy needed for construction planning. As construction progresses, laser scanning data can be used to compare the newly constructed work against the as-designed model or drawings for quality assurance. If laser scanning is used throughout the entire construction project, the new facility will have as-built documentation from all the major milestones in the project, creating a record of what is behind the walls, above the ceilings and under the floor slabs for owners to utilize throughout the lifecycle of the building. On a typical construction project, rework accounts for 12 to 15 percent of the cost of construction. With laser scanning, the ability to catch conflicts before they happen can reduce rework to 1 to 3 percent or less. This reduction translates into hundreds of thousands of dollars in savings on change orders, not to mention the advantage of keeping the project on schedule. For general contractors, this insight is the single largest benefit of laser scanning. 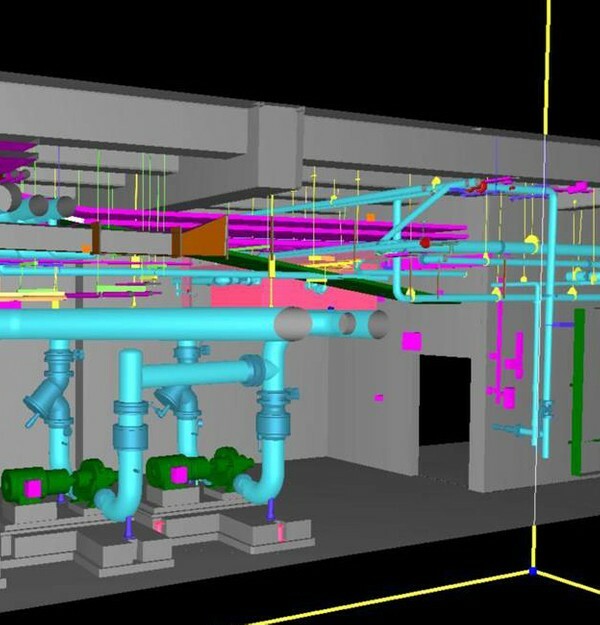 Laser scanning helps lower contractor risks by ensuring as-built drawings are accurate and by exposing any inaccuracies early in the process, before they turn into change orders during construction. The benefits of laser scanning do not stop at reconstruction coordination. Scanning progressively during construction to compare with as-designed models and drawings, provide archival records, and document critical milestones provides tremendous value throughout the construction process as well as to the owner as the building is managed, maintained and renovated. Since laser scanners capture reality with exceedingly high efficiency, they are primarily used in applications where this capability provides added value. In the BIM market, these uses generally fall into two categories: new construction and renovations. Laser scanning can be deployed in many places in a new construction project to aid the BIM process. For example, scanning all components as they are installed can provide a time-lapse record with millimeter accuracy data on the pipes, HVAC, structural steel, floors, and rebar in the concrete slabs throughout the building along with the actual installation date. This information can be compared to the design to verify that all components are installed in the correct place. If any errors are discovered, the design can be revised so that new components can be altered in the fabrication process instead of making costly changes onsite. Laser scanning can also be used to quickly assess the slab flatness of concrete floors, easily calculate the extents of any areas that need to be adjusted and accurately determine the volume of material needed. This capability leads to more accurate material orders and less waste. For renovations or additions to an existing structure, drawings are often extremely out of date or simply don’t exist. This makes designing any type of renovation or addition difficult. The laser scanner locates whatever it sees and “freezes” the site in time in its current form. This data then can be brought into CAD packages and used to develop extremely accurate existing condition drawings. Once these documents are created, laser scanning can continue to add value by capturing construction milestones and providing quality assurance as the project progresses. Laser scanning is a powerful tool that can save thousands of dollars in rework, keep projects on schedule and provide valuable information for all stakeholders. Whether you hire a service provider to do the scanning or self-perform scanning, there are countless benefits to including the technology on your construction project. Knowing how the laser scanning data will be applied is key to identifying the right solution. Before evaluating hardware and software or comparing service provider proposals, consider the following scenarios. One of the easiest ways to use laser scan data is to check construction progress against the design. When individual scans are dropped into a BIM or CAD environment, the dense scan data makes problems easy to identify. If problems are found, the scan data can be used to send measurements to the design team so they can make revisions to the design to avoid future conflicts. Data from laser scanning can also be used to inspect a specific aspect of construction and mine additional information so that corrective action can be taken if needed. One example is evaluating the flatness of a concrete floor. Since scanning captures so many points, the point clouds can be colored based on elevation to reveal any high or low areas in the pour. The extents of these areas can be established and discrete points can be derived and then uploaded to a total station to be staked out in the field. As a side benefit, the actual volume of material needed to fill in the low areas can be calculated from the laser scan data as well. For renovations or any construction project that lacks accurate existing conditions documentation, the laser scan data can be converted into models to provide the missing information. Laser scanning data tends to be so complete that users will have details all the way down to the bolt patterns on steel pipe fittings. 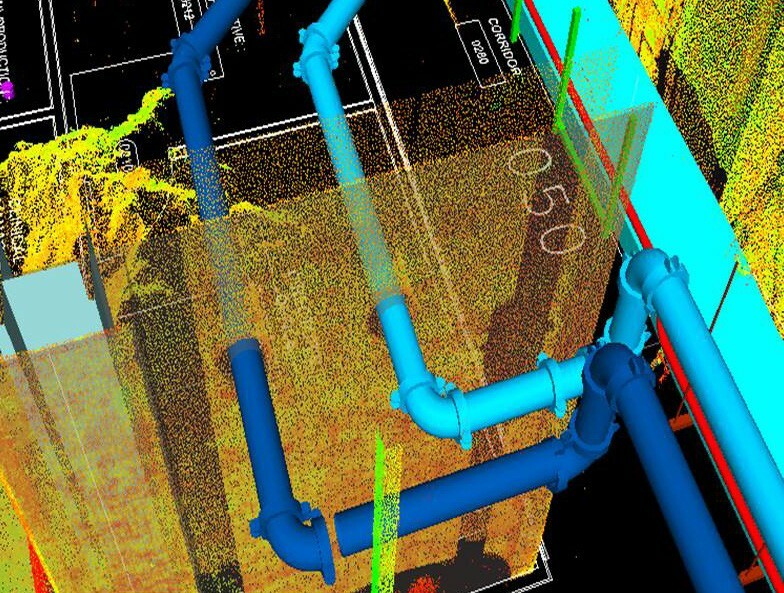 Many software packages have built-in libraries where actual sizes of steel and/or pipes can be identified and modeled directly from the point cloud. Libraries of shapes or grouped models can be made and used throughout the site. The point cloud can also be used to create paths with the correct clearances to remove large equipment from the site once construction is complete. There are several ways to add laser scanning to your construction project. Many general contractors outsource laser scanning to service providers that specialize in this capability. Increasingly, however, many firms are choosing to self-perform laser scanning either by renting or purchasing their own laser scanner and software. You avoid the capital investment. You don’t need to train your workers to use a laser scanner or hire qualified staff to handle the tasks. It provides greater versatility to address varied jobs, including access to professionals with expertise in niche areas, as well as a wide array of laser scanners with different functionality. Experience the benefits of laser scanning. Assess the market or internal demand for scanning. Provide your associates with an opportunity to learn the ins and outs of laser scanning side by side on jobs with an experienced professional. When calculating the ROI of using service providers versus buying, find out the daily costs of hiring a service provider in the areas you serve. These costs can range from $3,000 to $6,000 per day. So, for example, if you find yourself using scanning services 100 days a year, you’ll soon discover you’re leaving money on the table and might want to make a purchase. Once you’ve employed a service provider a few times and your associates are trained and ready to step out on their own, you may want to take on more of the scanning work in-house. If you can’t yet support a purchase based on your scanning volume, renting could be a perfect way to reduce costs, increase your margins and test out your success. Rentals are also a good option when you need a specialized laser scanner that you might not use on an ongoing basis. If you have a continuing need for laser scanning and the expected ROI meets your investment goals, then buying a laser scanner is the best solution as long as you have trained staff that can optimize its use. This investment will cut your costs, as well as help you maintain your competitive edge and allow you to respond quickly when laser scanning opportunities arise. General contractors that are at an intermediate or advanced level of laser scanning often benefit by having access to one or more laser scanners in house. Whether you purchase scans from a service provider or self-perform laser scanning, the software used to process and manage the point cloud can make all the difference in maximizing the value of your investment. Even if you choose to outsource laser scanning services, you can still manage your own point clouds with a minimal investment in software. In fact, using the software as the foundational component of laser scanning can give you the maximum amount of flexibility in applying laser scanning to your projects. Many GCs have successfully moved into laser scanning by starting with software. The software should integrate seamlessly with the hardware and allow you to easily view and measure from the point cloud as well as export standard industry file types. Combining multiple scans together—a process known as registration—should be fast and easy and should allow you to create an accurate site representation through a variety of different methods. Other considerations include data extraction tools that make it easy to view and work with the data; modeling tools that provide extensive shape libraries and clash detection capabilities; viewing tools that enable point cloud data to be shared with clients; and import tools that allow you to work with data from multiple scanner makes and models. Recent software advances have made it possible for popular CAD packages to work directly with point clouds. Beyond basic point cloud processing and viewing, look for software that can bridge the gap between the point cloud and common drawing and modeling software with the least number of steps. Regardless of whether you outsource, rent or purchase a laser scanning solution, having a basic understanding of laser scanning hardware can help you more easily evaluate the options. Laser scanners are like robotic total stations on a massive dose of steroids. They can capture 50,000 to 1,000,000 points per second in a 3D space. These high data capture rates allow for quick setups and pave the way for covering vast areas in short periods of time. One million points per second is probably excessive for basic spot checking applications. However, if you need high-resolution scans of a complex environment in a short amount of time, speed will be critical. Also, if you plan to self-perform the work, consider how your needs might change over time. Most general contractors that start with basic applications quickly progress to intermediate and advanced uses once they become comfortable with laser scanning. When considering the range you require, think about the accessibility of areas you need to scan. If you need to capture data from a structure that’s hundreds of feet above the ground and don’t want to invest in lifts or scaffolding, then you’ll need a scanner with a longer range and the ability to capture site control at range. Measurement accuracy is the range within which measurements from point clouds are accurate. Make sure the laser scanner used on your project meets your accuracy requirements. A high-quality scanner will have survey-grade tilt compensation, also called dual-axis compensation, a feature that is standard in total stations and enables the instrument to always know “which way is down/up” and correct measurements for deviations from vertical. Tilt compensation provides tighter registration; overall better project accuracy; a reduced need to place, scan, survey, and gather targets (which means increased field productivity); and increased field flexibility for addressing various site logistics and project situations. The environment can have a huge impact on productivity with a laser scanner. That’s because some scanners don’t produce accurate measurements in extreme temperatures and humidity. So check the scanner’s operating temperature ranges. Also, if work might need to be performed in rain or extremely high humidity, make sure the scanner is noncondensing—in other words, its performance is not affected by humidity. All laser scanners are rated by the Center for Devices and Radiological Health (CDRH) for their eye safety. The levels range from Class 1 to 3R, with a Class 1 device being the saf-est, as no precautions are required. A Class 2 laser is also considered quite safe because the human blink reflex will limit the exposure to no more than 0.25 seconds. You need to be able to use the scanner’s data easily in order to make critical decisions regarding new installations and maintenance. If you plan to purchase your own laser scanner, look for a solution from a company that also provides software, training, and support. That way you can rest assured that you’ll reap the rewards from your scanner investment. The building construction industry is just in the beginning phases of adopting laser scanning as an integral part of a BIM process. The first step is understanding how and where laser scanning fits into the design and construction process and the value or return on investment. Most as-built drawings are inaccurate and incomplete. If a building renovation or retrofit is designed based on outdated or incomplete drawings, errors will be “designed in.” These errors will be completely invisible until the construction phase, when they are very expensive and time consuming to resolve. The best way to avoid these unwanted surprises during construction is to perform 3D as-built scanning to capture the complete information about the space to be renovated. Capturing accurate as-built data for renovations or retrofits requires first scanning all areas of the building involved in the project, then registering or stitching together the point cloud data. If drawings or models exist, the point cloud will need to be oriented to match the coordinate system of the drawing or model so both sets of data align. From there, the as-built scan data can be compared to the existing drawings or models. The models and drawings can be adjusted to match the scan data so the team can begin design. If no models or drawings exist, the scan data can be utilized as a “template” to create the new documentation. The point cloud can be sliced horizontally to expose a plan view that can be traced to create very accurate floor plans, or it can be sliced vertically to expose elevation views for tracing. Isolating point cloud data is a great way to model or draft on point clouds. Construction costs and waste are at alarmingly high rates. The balance between speed and quality is difficult to achieve. Automated quality assurance tools provide valuable insights that help contractors plan better and head off problems before they materialize on the jobsite. One of the simplest and most valuable laser scanning applications is scanning during the construction process to validate that the work put in place is as designed. Without the context of building elements yet to be installed, the naked eye cannot detect most construction issues. Laser scanning is the fastest and most accurate way to capture the complete jobsite so work can be evaluated on a weekly or daily basis to assure the best quality construction. This process starts with scanning all areas of the construction site to be analyzed. Then the point clouds are registered together and oriented to match the federated model. The point cloud data is then married with the model geometry and either visually analyzed or evaluated with automated tools to identify clashes and deviations (areas where model geometry exists but no point cloud data, or vice versa). 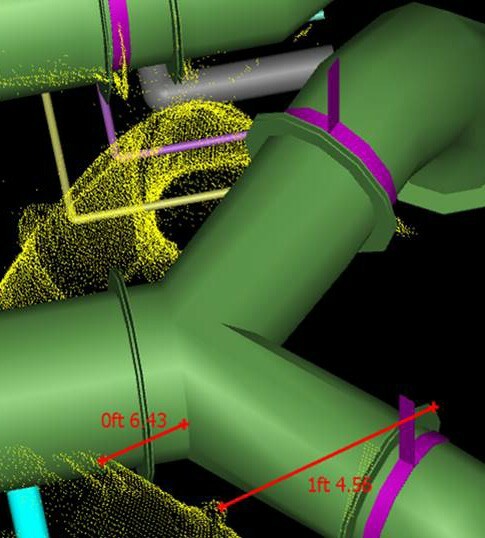 When deviations or clashes are identified, the team can investigate the as-built point cloud and the virtual model to determine the source of the problem and find a resolution before it affects the schedule or budget. Combining high quality and performance with the highest environmental robustness in the market, the Leica ScanStation P16 is designed for easy entry into the world of 3D laser scanning. Its attractive price-performance ratio and user-friendly interface make it an appealing solution for all building construction scanning applications that require a range of up to 40 meters. The one-touch scan button (scan-and-go) and wizard style software guarantee an easy workflow and enable fast data checks in the field. No targets or spheres are required, which keeps the field workflow simple. Combined with WLAN remote control, the Leica ScanStation P16 can be operated by any handheld device. Autodesk® ReCap™ is a free to download collection of essential tools to import point cloud data from a variety of laser scanners and formats for visualization, fast and easy editing, basic measurement and scan preparation. Real View is an online service providing viewing, measurement, annotation and sharing of laser scan projects through a web browser. Laser scans collected from terrestrial 3D scanners create panoramic range images that are both visually compelling as well as measurable. These panoramas are excellent communication tools for conveying real-world conditions of a scanned environment without having a physical presence. Essentially, Real View provides an online and installation-free tool for viewing and sharing this data without the requirement of owning or managing a server. Real View is an online service is available through Autodesk® ReCap™ 360 and ReCap 360 Ultimate. ReCap 360 Ultimate is a feature rich solution that includes the breakthrough target-less automatic registration of scans. Easily and effortlessly register multiple scans without the use of targets. Save time by registering scans onsite at the same time you are scanning. Command complete control of scans and ensure quality with target-based accuracy reporting, survey control verification, target-based registration refinement, and registration rollback. ReCap, ReCap 360, and ReCap 360 Ultimate natively imports scans from a variety of vendors and standards including Leica. The ReCap product portfolio is versatile and supports most of the file formats providing an effortless and worry free method of taking control of reality data without conversion or manipulation of source data. ReCap 360 and ReCap 360 Ultimate advanced measurement allows for the easy analysis of point cloud data. Orthogonal snap makes it easy to validate clearances detect collisions. Cylinders are automatically recognized with details of center, circumference and diameter. Measurements are even easier with the XYZ components of distances. ReCap 360 and ReCap 360 Ultimate enables true collaboration between your stakeholders, including colleagues and project managers. With the advanced markup tools users can mark areas, tag notes, add photographs and save views to share with other stakeholders. Collaborators can easily search within a project for annotations and markups or tags. This online collaboration enables your team to review scans in a web browser, take accurate measurements and add tags to features. The ReCap Engine provides a seamless workflow into modeling and design: ReCap project files work seamlessly with Autodesk AutoCAD®, Navisworks®, Revit®, Inventor®, Infraworks™, Civil 3D®, Map 3D and Plant 3D products. Fully leverage the advantages of laser scanning in architecture, building and construction. The ReCap product portfolio also supports export of many other industry file standards and works seamlessly across the manufacturing, and media & entertainment world. Cyclone – Basic is the entry-level module and allows point cloud data to be imported from Leica Geosystems laser scanners for basic viewing, measuring, cleaning up and exporting to industry standard file types such as PTX, PTZ or e57. TruView Global is an installation-free and browser neutral tool where users can view point clouds on virtually any device from a cloud-based server. By utilizing the new JetStream ultra-fast point cloud visualization techniques, the TruView data can be used to extract basic measurements and query coordinates of an object, as well as create markups and even hotlinks to outside sources of data. The interface is simple and easy to learn and makes project collaboration easy. Cyclone – Register is a scalable solution that accommodates any scan project, from small interior renovations to high rise buildings to large infrastructure projects that span an entire city. Cyclone Register also supports multiple registration methods, including auto registration, cloud to cloud matching, object matching, target based registration or any combination of these methods, providing the ultimate flexibility to scanning professionals. All methods yield a highly accurate representation of the scanned area as well as detailed reporting of the registration constraint errors. Cyclone – Importer allows raw data from other manufacturers’ laser scanners to be used in Cyclone. For GCs that want to leverage the power of Cyclone to manage their point cloud data without concern about the scanner type, this module provides an easy solution. Cyclone – Publisher is the gateway to creating TruViews— scenes that combine both the imagery and point cloud data to create a realistic view of the site from each position of the scanner. This module also allows for the creation of GeoTags within the scan environment. Users can create bounding boxes around items in a scan(s) where a hotlink to externaldata needs to be placed. Once the GeoTag is defined, a hotlink will be created in each TruView scan position that has data inside the bounding box. This is a great tool to determine whether certain aspects of the project are visible from a given scan position. Cyclone – Survey enables concrete slab flatness elevation mapping or surface deviation calculations to be performed quickly and easily to reveal where to grind and where to fill. Layout points can be added to problem areas, loaded into a total station and transferred to the jobsite to physically mark problem areas. Leica Geosystems has a series of plug-ins called CloudWorx that use the power of Cyclone’s point cloud engine or the new, high-performance data server, JetStream, which makes it easier to handle huge data sets of thousands of scans and/or billions of points with full-density point cloud rendering in real-time, increasing the office productivity of cloud-based design review by up to 20-40%. Leica CloudWorx for Navisworks plug-in expands the integrated model concept by adding point clouds to model clash and deviation detection, useful tools that indicates areas where there is scan data but no model or where there is model geometry but no point cloud data or where they clash. It also provides enhanced fidelity and extended support to rendering, manipulating, and working with point clouds in Autodesk Navisworks beyond the application’s native capabilities. Leica CloudWorx for Revit plug-in adds simple tools for viewing and working with slices of point cloud data directly within Revit for referencing and modeling existing buildings. It also provides enhanced fidelity and extended support to rendering, manipulating, and working with point clouds in Autodesk Revit beyond the application’s native capabilities. Leica CloudWorx for AutoCAD plug-in adds simple tools for viewing and working with slices of point cloud data to speed up 2D drawing creation. Powerful new modeling tools enable as-built piping models and other 3D constructions to be created from point cloud data in the AutoCAD environment. Measure points along a grid for floor flatness/ floor levelness measurements right in AutoCAD. Today’s construction industry is characterized by shorter building cycles, shrinking budgets and growing expectations for accurate data on demand. Although this situation presents numerous challenges for contractors, it also creates tremendous opportunities for firms that wish to differentiate themselves in an increasingly competitive market. Whether you’re actively embracing BIM or just looking for a way to increase efficiency and transparency on the jobsite, accurate laser scanning and smart point cloud management software can help you reach your goals. To learn more, visit www.constructrealityxyz.com. With close to 200 years of experience pioneering solutions to measure the world, Leica Geosystems products and services are trusted by professionals worldwide to help them capture, analyze, and present spatial information. Leica Geosystems is best known for its broad array of products that capture accurately, model quickly, analyze easily, and visualize and present spatial information. Leica Geosystems is part of Hexagon, a leading global provider of design, measurement and visualization technologies that enable customers to design, measure and position objects, and process and present data. Autodesk helps people imagine, design and create a better world. Everyone— from design professionals, engineers and architects to digital artists, students and hobbyists—uses Autodesk software to unlock their creativity and solve important challenges.